The state of the American slasher film is not unlike the state of the domestic auto industry - once a vibrant, dependable cash cow, things have taken a turn for the worse as consumer appetites are increasingly stated by overseas imports. Meanwhile, the strategy at home seems to be based on distracting people with pale imitations of past glories or copying the successful templates of foreign competitors. We used to make things in America, dammit. It's no coincidence that the Scream series first emerged as people started to doubt our ability to keep churning out psychos and Chevys at an equal pace. 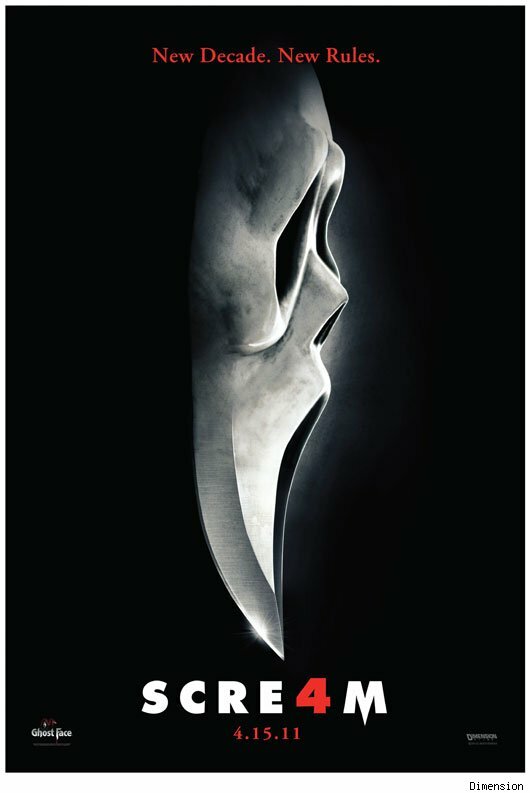 If the original Scream was a fevered attempt to perform triage on the badly hemorrhaging body of domestic horror, then Scream 4 fancies itself fit to give the last rites. The setup is familiar. Erstwhile victim Neve Campbell returns to Woodsboro, a town where an inordinate number of young people profile as serial killers and even more have met a brutal demise at the hands of various ghost-faced killers over the past 15 years. Her homecoming is predictably spoiled by the return of a knife-wielding ghoul, re-igniting the series' meta-commentary on the shifting "rules" and conventions of the horror genre. Series regulars David Arquette and Courtney Cox are bolstered by a new cast of warm bodies culled from the CW's primetime schedule and headlined by Emma Roberts as Campbell's shy, vulnerable cousin and Hayden Panettiere as her horror-flick-obsessed bestie. The irony is that, for a film that purports to reclaim and rewrite the history of horror, Scream 4 never strays too far from the wheelhouses of Craven and screenwriter Kevin Williamson. Like all Scream movies, it's a cavalcade of gruesome murders leavened by snarky humor in what feels like the world's most macabre game of Clue. There are several details for genre fans to appreciate (a scene where Panettiere rattles off a slew of recent horror remakes is one to savor) but the general shape of the story hasn't changed much. In setting its sights on hackneyed remakes and franchise bloat, Scream acknowledges its own formulaic underpinnings to mock its imitators but never fully realizes its satiric possibilities. Ending in a hurried mismash of media critique (some of it admittedly clever) the movie flees toward a safe middle ground - remakes and reboots can be bad or good, but Scream, like all the enduring franchises, will always be a trend unto itself. The franchise is dead. Long live the franchise.